The Edinburgh Alexander Training School (EATS) provides comprehensive training in the Alexander Technique. We offer Professional training to become a STAT-certified Alexander teacher, and we also offer a Foundation course. 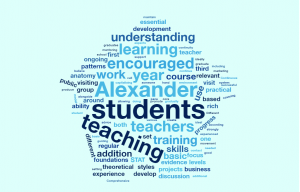 If you undertake the full course you will be trained in all aspects needed to become a competent, confident, thoughtful and considerate Alexander teacher, and you will gain a life-transforming professional qualification. Whichever course you choose, we want to provide the best Alexander training possible – enabling you to deepen your Alexander understanding and skills to enrich your life and find greater resilience, poise and joy. You are likely to enjoy some profound mind-body (physical, mental and emotional) changes during the training as you begin to embody Alexander principles and skills. Continuous and Ongoing: graduates are encouraged to continue to visit the school on a regular basis to gain experience as a teacher until they feel sufficiently established. A mentoring system provides each graduate with an experienced teacher who they can call on for ongoing advice and support.